The femurs rotate in the hip sockets, especially as the skis turn while the body turns less (via counteracting). Femur rotation is critical to movement in general and creating separation and has many implications, depending on the timing, the flexion of the knees and whether the rotation is active or passive. It is however often misused and mis-understood, so read on. The way the femurs rotate is the difference between pivoting and carving: do we turn the femurs with an active effort of the respective big and imprecise muscles or do we allow the femurs to rotate, as a result of the lower feet tipping the ski on edge (with the small, precise muscles) and the ski interaction with the snow (sidecut)? Do we actively turn the feet and steer the skis around the turn or do we turn the upper body the other way instead? Active: while standing, with a long leg, if we use the upper leg muscles for rotation, this will result in pivoting of the skis at low angles, also accompanied by separation of the upper body (counter). 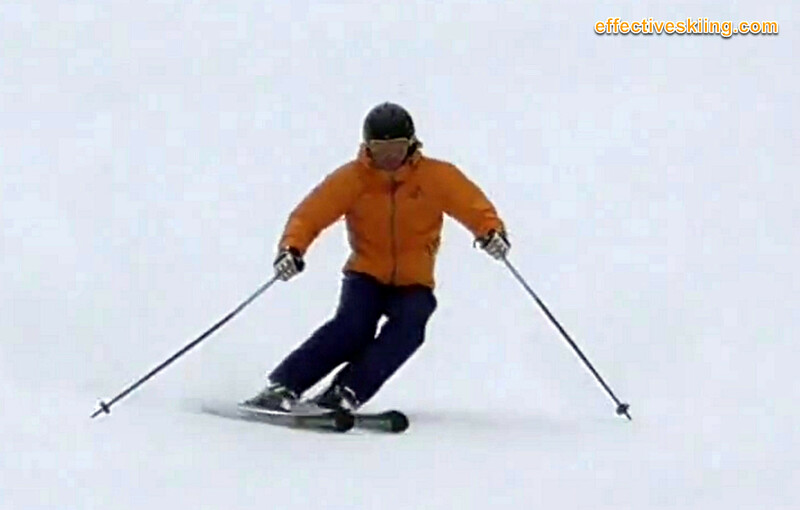 Passive: if, on the other hand, we put the skis on edge with the lower legs and let the skis turn because of their sidecut, while we focus on turning the upper body the other way, then we get again femur rotation in the hip sockets, but we are not pivoting, whether the result is skidding or carving. Basically, the femurs rotate in this case because they follow the ski around the turn - a passive rotation. Active (again): as we reach deeper angles, we can shift attention again perhaps to the stronger leg muscles, accompanied by femur rotation and separation, while carving with big angles. It may sound like nitpicking, but the outcome, the result on the snow of the different approaches is very different. See also the Skiing and countersteering discussion. When the leg is long, an active rotation of the femur along its length will cause a pivoting and a skid, while the same active rotation with a very flexed leg (say 90 degrees at the knee, as in the photo below) will result in more edging instead, given the way the leg is articulated. When the knee is bent just in-between, your result will also be in-between. The other approach to putting the skis on edge, the one that we prefer, is foot tipping. Bio-mechanically, the femurs need to rotate slightly just to allow inversion of the foot to occur, leading to a passive rotation: we try to tip the skis on edge from the ankle/foot (orange below) and allow the femur to rotate (blue arrow). This is a simple test you can do at home - sitting on a chair: the long boot will tip the knee over, if you focus on foot tipping - if you only allow it and not oppose it. So you can see that sometimes, active femur rotation continues and complements edging in good turns and increase edge angles, while some other times it leads to pivoting the skis and taking them off the edge. Further, shifting attention to the outside ski now: if the edge of the outside ski is engaged firmly and carving, at some edge angle and with a long leg, rotating the femurs will effectively just apply more pressure to the tips, perhaps enhancing the Steering or Carving action, while simultaneously unweighting the tails - which tend to break away if this effort is strong. But, it cannot help with edge angles anymore - instead it will help twist the hips to create counter. So there are limits to the femur rotation's help to edge the skis, at high angles... as the outside leg becomes long and engaged, it is harder to rotate the femurs - other movements help at high edge angles. In fact, we strongly recommend that skiers do not focus on the femur rotation much, but on the subtle ankle and foot movements involved in tipping the skis on edge, complemented by the counteracting of the hips to create separation - these lead to a more effective skiing, one where we feel the snow and work with the ski, rather than muscle them around the turn! If you're thinking it's required for skidded/short turns, that's only true when the legs are long (no edge angle). In terms of movements to focus on, there are many ways to achieve skidded turns, see Oversteering for the biomechanics involved there! The notion of femur rotation has always been quite confusing to me, because it is often used imprecisely. The term as such means a rotation of the femur along its long axis, with the results we just described above (pivoting or more edging). It is often used however to also reference the rotation of the head of the femur in the respective socket (acetabulum), which can be around any of the axis of motion, including lateral movements of the femur (abduction / adduction) as well as pretty much anything the upper body wants to do (say hunch forward at the hips). To say that "separation" as in counterbalancing is a result of femur rotation is not correct, as it really is a result of, at edge angles, of the adduction of the outside femur and rotation of the inside femur (as the outside leg is long and the inside leg is flexed). It can also equally be a result of simply flexing laterally at the hip (i.e. an upper body action), especially, if the ski edge is engaged (carving). If the ski is engaged, we are in a closed chain situation and we are not free to do whatever we want with the femur. In this case, for instance, separation is a result of the hips moving on top of an engaged leg, i.e. counteraction. The rotation of the femur is generally an active input for steering and pivoting, but a passive result of engaging the ski into the snow (carving). And remember that by carving we don't mean just the edge-locked kind, but basically any time the skier is successfully obtaining more ski performance than not. See Anatomical terms of motion for skiing for a detailed description of what these terms mean (rotation, adduction etc) - they are very specific. We've seen that it depends on the timing and speed of the turn, depending on how flexed we are at certain points in the turn, we may actively use it to help edging and getting the skis out of the way, or pivot and steer the skis. While we certainly make good use of it, we tend to not focus on femur rotation, however, as it has varied effects, depending on the timing, positions and performance. Especially at the top of the turn, it is good to avoid strong femur rotation when working on your skiing, to learn the intricate ski control from the lower legs (feet and ankles) that keep the edges engaged and result in a clean engagement. Think about the fact that when driving the ball in golfing or tennis, although the hips are certainly involved, that's not where the fine control comes from. Similarly in skiing, we don't have fine control from the big strong upper leg muscles, but from much lower. Also, as the skis are light on snow in the transition between turns (or even floating in high performance skiing), it is very easy to pivot the skis when focusing on femur rotation, because the strong muscles of the upper leg are not as precise as the small muscles of the foot, so if we're looking for a clean switch of the edges, again focus should be on the feet and ankles. Member-only content avilable (171 words). You should train your eye to pick up these refinements, you should get used to picking out foot tipping in a skier, if you are to recognize good skiing. Here are some of the cues. Member-only content avilable (182 words). Femur rotation is an important part of all movement and skiing, all good upper and lower body separation occurs at the hips, not the spine. However, we need to be very clear about its uses and now, sensitive to its results in different situations as well as its general misuse, perhaps we'll look at it more often as a result of other intents rather than an intent in itself. Viewed 5129 times ( | Print ) this page.